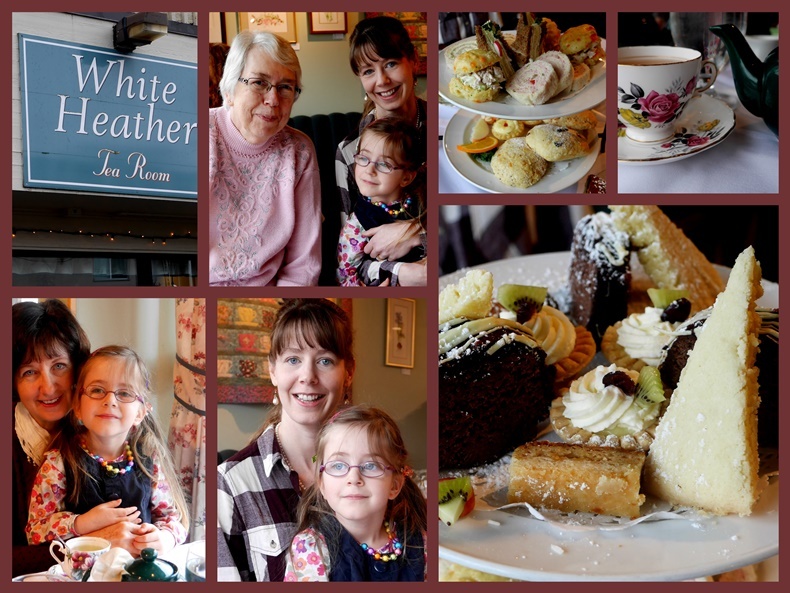 A few weeks ago, my daughter invited me to an afternoon tea at the White Heather Tea Room, along with her mother-in-law, and Little Miss S.
How civilized to sit and drink tea, eat ginger-apricot scones, elegant sandwiches, and sweet treats while the rain dripped outside on a very dreary day. We three adult ladies ordered the Not-so-Wee-Tea, while Little Miss S had the Wee Tea. It wasn't so wee, and Miss S isn't so little anymore. Her tea was served all at once on a single plate. I watched her nibble one sandwich, and take a bite from another. She ate her apple slice, and then, it seemed like an epiphany occurred. There was chocolate cake. And shortbread. And butter tart square. ALL ON THE SAME PLATE! Surely, her mind seemed to reason, that meant she could eat it in any order she wanted. So she did what any little person would do, she started with the chocolate cake, moved to the other sweets, and then the scone and chicken salad filling. She packed away most of that Wee Tea, along with two teacups of mint tea. What fun! Although the tea wasn't a seasonal celebration, it coincided with the first Sunday in Advent the next day, and in a way, it felt like the beginning of this wonderful season. What a special time together! And I like her idea about the order to eat things! Oh and mint tea is my favorite! Enjoy your week! Hugs! That is a wonderful way to start the season of Advent off for sure. I'm happy to say I've enjoyed tea at the White Heather Tea Room upon the recommendation of dear Pondside. My sisters and I enjoyed it very much. Lovely photo of your time together and I like Little Miss S's style! I think I might have done exactly what Little Miss did! Desserts first! lol! Everything looks wonderful. I would love to do a fancy tea somewhere soon. 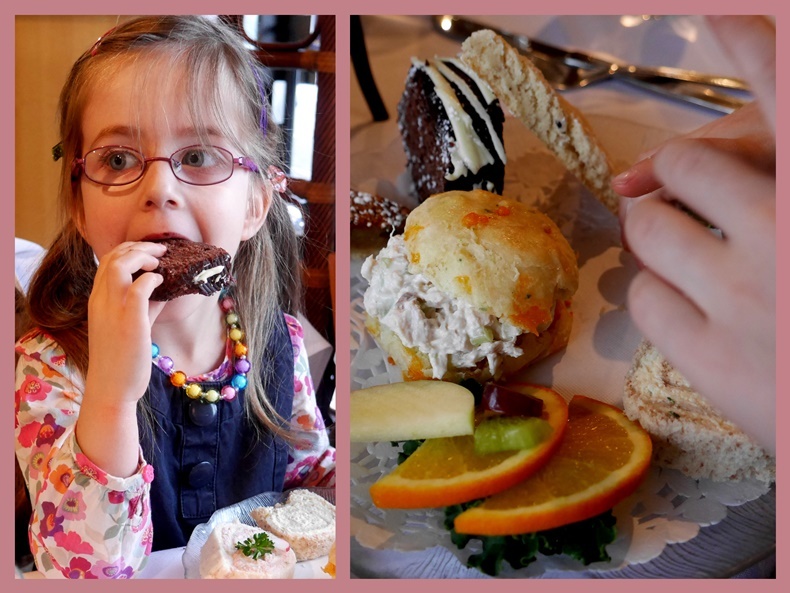 Afternoon tea at the White Heather Tea Room sounds like a wonderful treat whatever age a lady happens to be, you're never too young (or old) to enjoy tea time treats such as these. I like your simple Advent wreath, I lit the first of our candles at teatime on Sunday. Lovely to have your company for Mosaic Monday again this week. Lorrie, What a wonderful time with family. Thanks for sharing. Sylvia D.
A perfect way to spend a rainy afternoon with daughter, grandaughter and a wonderful tea! What a delightful tea party!! Making memories, that is what it is all about. Be sure to review these photos with the wee ones as they grow. My Ms. C. didn't remember half the stuff I sewed for her...UNTIL I showed her the pictures & discussed it with her. I love it when granddaughters come for tea with us, they take as much delight in the food and presentation. It would have been fun to see yours trying bits from all over her plate! Advent is here again, where does the time go? Enjoy the rest of your week Lorrie. Paul and I enjoyed the White Heather Tea Room in the Summer when we visited Victoria as they also serve a lovely Gluten Free High Tea. I wonder if you went into the lovely French shop close to the tea room that specializes in chalkboard paint and painted furniture? They also had some lovely gift items, and when I visited, I thought of you! What a lovely outing for all of you! I get such a kick out of little ones at tea time. One never knows how they will respond and how much they will consume. Such a sweet age! Thank you for sharing with us and have a lovely rest of November, Lorrie. What a lovely way to celebrate the start of advent. I love watching young children eat, it's quite fascinating! She is a smart girl, I would have had the cake first if I could. Your tea sounds delicious. Just lovely to spend time together, and thank you for sharing your lovely photo's. What a delightful tea! The food looks scrumptious. Like your granddaughter, I would have gravitated towards the chocolate cake too. Life is short. Eat dessert first! What a special afternoon you ladies had! And Little Miss S has it all figured out - always eat the chocolate cake first! A girl after my own heart! A lovely way to start the season. What sweet expressions flit across your grandgirlie's face. Just imagine how fondly she will always view tea time. I would love to take my oldest granddaughter to a tea someday soon! I'm sure she would enjoy it just as your granddaughter did, Lorrie. Nice way to begin the Christmas season and celebrate the first week of advent. That sounds like such a delight! What fun to watch her discover those treats and a perfect solution to a dreary day! I had a chocolate chip scone, not my favorite, and I'm sure not as good as ginger and apricot. Sounds wonderful! Oh...you make me want to host a tea again, and I will be sure to invite three generations! The last one I had did include some young girls, and they loved it. May the tea tradition grow stronger as the need for its example of elegant civility increases. So civilized...and delightful! What a nice way to start the holiday season. How lovely! I agree, if it is all on the same plate, as long as you eat it you can eat it in any order you like can't you! It is magical moments like these that we can treasure forever. Little girls and tea parties--you can't beat that combination. I love her necklace! It seems rain outside just adds to the coziness of such a tea time. Really special! As if the tea isn't grand enough, enjoying food company makes it even better. The little girls while have wonderful memories. Grandmas, too. What a delightful tea party, Lorrie! You all look beautiful and so happy to be enjoying some girl time. Reading the story of your granddaughter's "epiphany" just put a smile on my face. Maybe we all should think like a child! Thanks for sharing the joy with us. Oh, what a lovely way to share an afternoon! Isn't it delightful to watch little ones experience something for the first time? Little Miss S is certainly growing up. What a delightful afternoon tea and such cheerful faces! Wishing you and your family a lovely and happy Advent season! An afternoon tea with loved ones, what could be nicer? Heart-warming photos. Tea time at the White Heather is the very best way to begin the holiday celebration. How fun for your grand daughter. I would love starting with the chocolate cake for sure. It all looks absolutely delicious and wonderful. I love going to tea with my daughters. I love your granddaughters' enjoyment of all the delicious foods on her plate! Lorrie, how fun! I sort of do what your granddaughter did -- I eat my sandwiches first (unless the scones are warm, then I eat those first) but hold one or two sandwiches back to eat at the end after the sweets. But I don't eat all the sweets, just a nibble or two, and then finish off with the reserved sandwich. And drink about 6 cups of tea!